Video documentation of final work. In my OCA personal assessment folder, Final Assignments sub-folder. Copies of all tutor reports. In my OCA personal assessment folder, Tutor Reports sub-folder. My submission for assessment is en route to the UK. In her final formative feedback my tutor expressed an interest in seeing as much actual work as possible. All my assignment submissions have been electronic, via this blog. 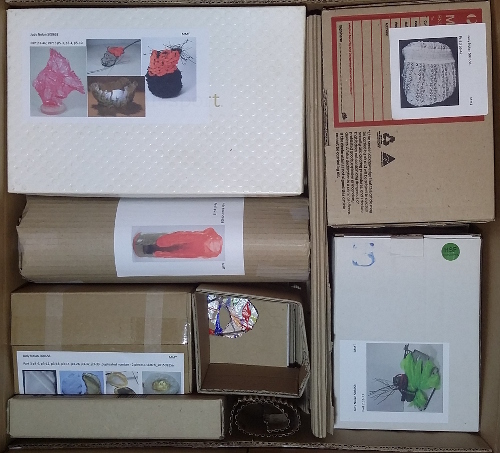 I have therefore attempted to include as many samples as possible in the package, within the normal constraints of international post. Part 1 book. Link to pdf (for ease of access to referenced blog posts). Samples included: p1-25, p1-31, p1-49, p1-55, p1-62, p1-104, p1-114, p1-140, p1-141, p1-142. 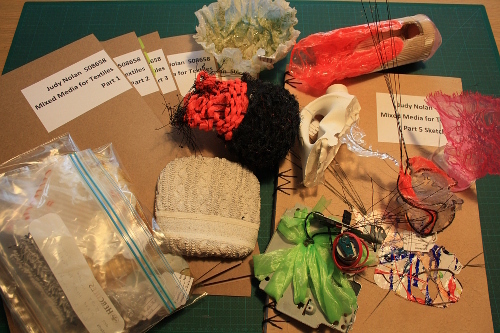 Part 1 – bag of samples. Samples included: p1-1, p1-12, personal extension photo 10. Samples included: p2-2, p2-3, p2-4, p2-9, p2-15, p2-19, p2-21, p2-23, p2-27. Part 2, packed individually: p2-73. Samples included: p3-6, p3-10 (adjusted for p3-26, p3-12 (in 2 parts), p3-13, p3-14, p3-32, p3-33 (2 items – duplicated number), plastic sketch of p3-47. Part 3, packed individually: p3-46, p3-47, p3-51. Prints included: p4-8, p4-15, p4-17, p4-22, p4-23, p4-29, p4-34, p4-36, p4-37, p4-45, p4-46, p4-60, p4-70, p4-72, p4-75, p4-76, p4-77, p4-81, p4-85, p4-89, p4-97, p4-104, p4-109, p4-126, p4-128, p4-137, p4-145, p4-146, p4-150, p4-152, p4-160, p4-162, p4-163. Part 5, packed individually: p5-3, p5-4, p5-10, p5-12. Part 5, folder of printed photographs. Trial photographs (4): Samples p5-38 (12 March 2016, black and white), p5-52 (15 March 2016), p5-53 (15 March 2016, watercolour paper), p5-54 (18 March 2016). Following Formative Feedback from my tutor (8 April 2016) I knew I had to be clearer about my Final Work for Mixed Media for Textiles. My final work is an installation of a collection of vessels, documented for assessment purposes in video and photographs. Given I felt I was close to the limits of my tablet video technology, Rebecca’s comments about the growing importance of film in distance learning plus a clearer learning path with OCA, I chose to invest in a new video camera and editing software (details 17 April 2016). A final risk in a risk-embracing course. The arrangement of the objects was close to that seen in my earlier video documentation (15 March 2016). The purpose was to improve the documentation of my final work, not the work itself. The orientation of the group to the source of daylight was changed, and additional lighting from each side used. The plaster samples near the front look a little washed out in the new still photographs. I’m in the process of selecting and printing my final choice of photographs and will probably use some from the earlier session and update this post then. Sample photographs have been printed on A3 glossy photo paper – one each of black and white, the wrapping photo session and the third photo session – plus one more from the third photo session printed onto a heavy watercolour paper (Stonehenge I think). All the images look better printed than on the computer and I’ll include them in my submission pack as samples. The watercolour version looks softer, a bit less sharp, a bit more textured than the glossy paper. I’ve decided to use the crisper, clearer glossy paper for my formal documentation set. The video is much clearer, but very jerky as I learn to manage the controls. I’ve spliced together small sections to create the video and it gets rather repetitive. Despite these drawbacks I think it provides improved documentation of my final work, especially as I will be able to upload a higher resolution version to the OCA drive for the assessors. In addition to the general views there are lots of detail shots, as requested by Rebecca. I hope this provides a clearer record of my installation. 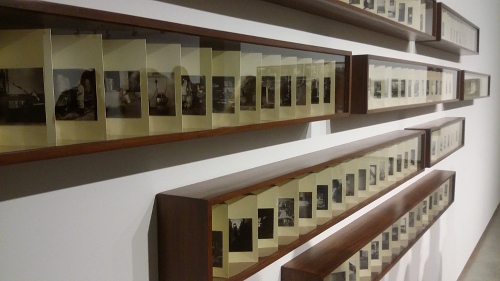 There’s a narration in which I’ve tried to highlight aspects of the installation and the collection. With the detail sections I’ve included inset photos in the corner showing the full sample and its identification. A larger, higher resolution version has been loaded into my OCA folder for assessment. The smaller version is below. All the sketching work of Part 5 is now bound into a book ready to send for assessment. Before showing that I want to show the final few pages, not previously posted. At the top, manipulation of a photo inspired by Dryden Goodwin’s mould prints (http://www.drydengoodwin.com/mould_prints_2011.htm and http://www.drydengoodwin.com/Mould_2011.htm). At first look these seemed like plaster or perhaps clay masks, but they are actually photographs that have been pierced and torn and moulded to become three dimensional. I wondered if this could be another way of presenting my photographs of objects – so many links to exercises in the course! The result wasn’t encouraging. I was working at small size and the vessels aren’t a common shape so there is no assist from the human visual system. The final straw was that my photo paper has the manufacturer’s name on the back – very distracting. Below that is a printout of shape play. I’ve spent some time playing with photos to create simplified shapes, thinking of using them to experiment with compositions, or perhaps as stencils. Random jottings, including trying to get my head around time zone differences with various changes to and from summer time. This shows a photo printed on watercolour paper and put into the sketchbook. Above is the actual photo, using my simplified shapes and putting them into a space – Flinders Island. It’s very flat, the shapes sitting on top, as if a sheet of glass separates them from the environment. In another attempt I used actual photos of the vessels, most of them with opacity reduced trying to get them to fit in better. Not worth pursuing. I was taken by Briony Fer’s comments about Hans Arps use of line, so experimented making forms buckle with different scales of line. I was dissatisfied with the photographs I took of my vessels wrapped in brown paper (18-Mar-2016). One of many problems was the flat lighting, so I tried drawing on a printout of a photo to see if some highlights and shadows would improve matters. A great improvement, as is simplifying the floor and wall patterning. Definite lessons there. The plan was always to bind my Part 5 sketch work into a book. I’ve tried to bring together a few ideas from the course. 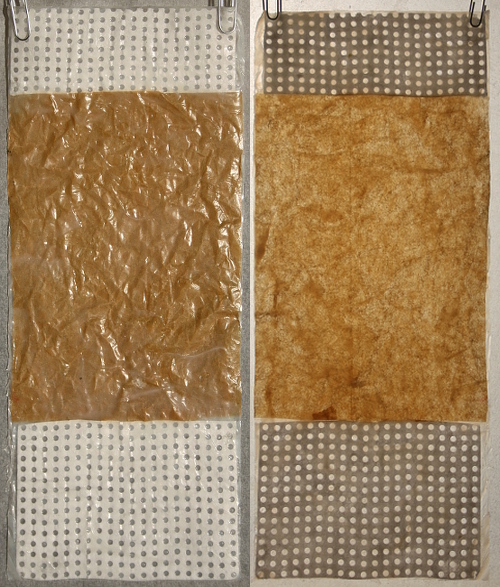 The front and back covers were first covered in crumpled brown paper – echoes of Part 1, and also of various wrapping exercises. Out of that complex academic treatment I extracted simple ideas of dribbling paint and collage. For the binding I used a packed cords technique from Exposed Spine Sewings by Keith Smith. I like the use of wrapping, travelling up the cords on the spine, and designed the spiky black attachment to echo the zigzag stitching on sample p5-4. One of the useful features of p5-4 is the plumes of black, which arch over space and link areas in my compositions. Here they arch across front and back of the book, sheltering sample p5-8. I think the end result is attractive, appropriate, not particularly robust but sufficient for the journey ahead. Smith, K (1995) Exposed Spine Sewings: Non-adhesive binding volume III Rochester NY: Keith Smith Books. Earlier this week I had my final tutorial for the Mixed Media course – for the first time a video call with Rebecca followed by a brief summary document. It was very helpful to hear her feedback, to be able to ask questions, get clarification, and I think she found it useful to understand more about me as a student, my interests and responses to the samples and the course. There was a price. The connection got quite choppy towards the end, making it hard to hear everything. Also when I spoke there was a strong delayed echo which made it difficult to keep focused and coherent. Even a slight murmur of agreement as Rebecca was speaking could cause a glitch. It worked better when we each spoke in blocks, rather than a fluid conversation. Rebecca quickly followed up the call with a brief written report, and I took my own notes, but I miss the more extended reports of purely written feedback. Still, a very valuable experience and a contact method I’d use again in the future – but not every time. Click here to read the written report. Overall Rebecca was very positive about my work and more especially my work process, noting I am clearly engaged and have made the course my own. I can only agree – the process given in the MMT course is a wonderful fit to my natural way of working and I feel empowered by it, equipped for my ongoing creative explorations. The course gave a level of structure combined with openness to interpretation, both supporting and freeing. I’ve had a wonderful time! Rebecca commented that I was thorough, probably too thorough, in the initial Review stage. She wondered if I would be able to emerge and go on to new work. I can see that, and I may have commented in this blog that at times I felt almost overwhelmed by the number of ideas and potential avenues generated. My natural methodical approach and a desire to both tick boxes and demonstrate process to tutor and assessors probably accounts for it. I can’t regret having created an amazing resource that I can return to for material in the future, but it would be worth being open to a more instinctual, flowing approach. 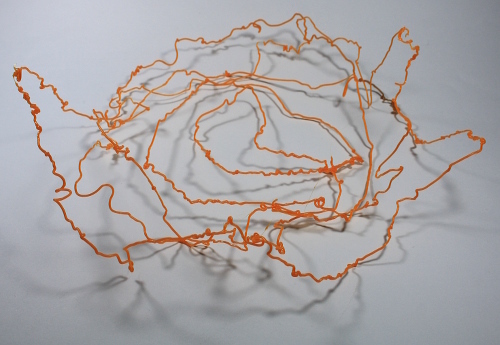 Research has been an integral part of my work throughout the course and I was pleased that Rebecca saw how it has influenced and shaped my work. I think taking Understanding Western Art as my second OCA course was a good choice for me, providing research skills and a basic framework of knowledge which I can build on. Rebecca suggested I keep looking for the way people develop ideas. I think if I keep reading, keep looking, keep curious, that should happen. I quite often go to lectures etc, but it could be worth doing more to seek out the voice of artists themselves, not just commentators. For example I found it fascinating to listen to oral history interviews with Claire Falkenstein (11-Mar-2016), and a panel discussion including artist Dane Mitchell entirely changed my understanding of his work (20-Mar-2016). Rebecca was very positive about my sketchbook and my use of drawing as a tool. Frequent and varied drawing was a major goal for me in this assignment. I might freeze up if asked to do a drawing where the end result is the drawing itself, but I enjoy functional drawing – to see, learn, understand, to record not a picture of an object but what I see or feel about an object. There’s no right or wrong result in that, so it’s easy to be loose and exploratory. Rebecca cautioned me not to stop – a good reminder as my drawing has fallen away a bit during this transition period. We discussed presentation and what to send for assessment. Great news is that Rebecca is not fussed about mounting work etc – she’d be happy with large photos rolled in a tube. The assessors quite happily rummage through work and it’s important to send a variety that they can handle. However I need to be very specific about what exactly is my Final Piece. Good call, given at the moment I don’t know myself. Rebecca was encouraging about my videos, and suggested a film – something that could be viewed on a largish computer screen. She sees film as increasing in importance in distance learning, and given my interest in installation it makes a lot of sense. Photographs are another possibility, large (say A3). I’ve already printed out a few that size on glossy paper. I’d like to go for film as the most effective way of showing what most interests me, but want to find a way to step up the quality. Wheels are turning. Interaction with other students was another topic in our conversation. It’s been directly influential for me, with research into other students’ work (7-Feb-2016). In addition I’ve been helped by research suggestions, general support and of course inspiration. All of this was of interest to Rebecca. It’s a little way towards the sharing that happens at a bricks and mortar university and shows that distance learning is much less solitary these days. One great thing about the direct conversation was being able to discuss future options. I’ve thrived in MMT and want to grow in that exploratory, sampling approach. There’s an update coming soon to one of the existing level 2 courses, making it closer in approach to the new level 1 courses. A brand new level 2 course is coming out in September. The apparent catch is that the new course fits better done before the revamped one, which would mean taking a break from study until the new is ready. I think this will suit me very well. I have unfinished business, research strands I want to follow up, some learning to do on lighting and photography, plenty to keep me busy, engaged, learning. I had a similar wait when I transferred from Exploring Ideas to Mixed Media for Textiles, and with hindsight that was one of the best decisions I’ve ever made. So “what next?” seems to be answered. This post about the current Biennale of Sydney is partial in that I’ve only visited a couple of the sites so far, but even more because I am anything but an impartial viewer. Everything I see is through the lens of my own recent work, considering alternatives, possible future options. Such bias feels uncomfortable – I feel partly closed to entering another’s view of the world. Is it to an extent a good thing – a personal voice, a personal perspective, isn’t that what I am meant to be developing as an artist? Whichever, clearly it’s something I need to work through. At the Art Gallery of New South Wales A magical substance flows into me is a 70 minute HD video with sound by Palestinian artist Jumana Manna. It’s a complex compilation based on research into broadcast music recordings from across Palestine in the 1930s. Manna documents playing these recordings to musicians across the country, asking them to perform in response. She “investigat[es] the spiritual nature of music and its capacity to shape both identity and cultural and religious rituals” (from gallery signage). I’ve watched sections of the video during different visits and what struck me was the personal nature of the footage, often in domestic settings, the intensity and interest of the musicians and their joy in performance. The video is shown in a space that includes a number of sculptural works by Manna. This untitled collection of sculptures, made of plaster, pigments and laquer, are domestic in scale. They are strangely familiar in form – dried gourds perhaps, or human lungs. Empty containers that would resonate, like a musical instrument, like a human body. To me there’s a sense of the domestic, the hospitable, in providing an installation with inbuilt padded seating. 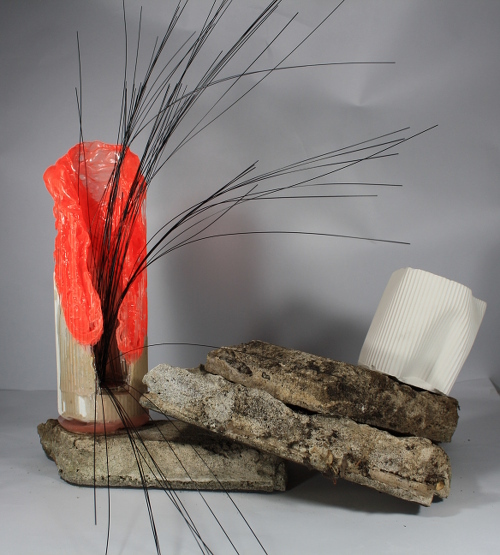 There is variation in shape and colour of the sculptures, but connections in line and material. There are similar forms in different colours, for example the double lobed form that is reminiscent of body parts. The grouping is varied but cohesive. 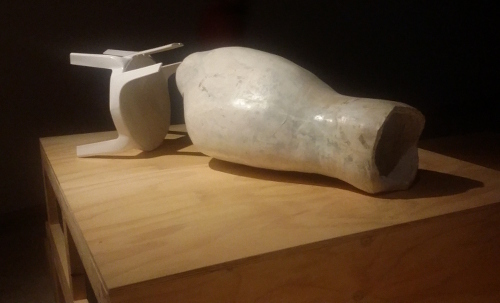 As can be seen in the installation view there are two larger sculptures, separated in space, size and the inclusion of additional found elements, but clearly connected. The installation brings the viewer in, a participant in the journey of discovery through a divided land where music knows no boundaries. 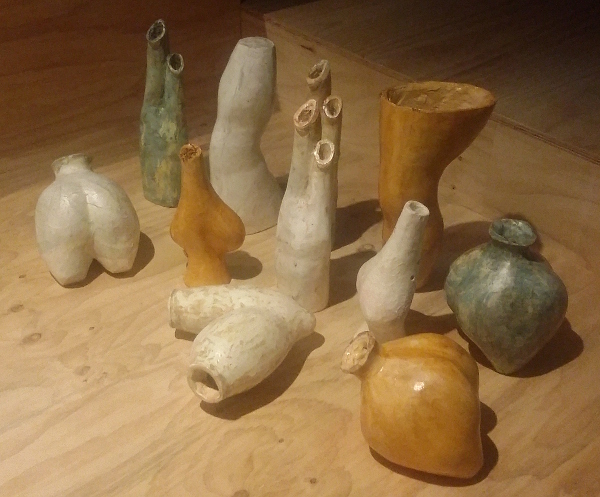 Manna’s work is in the Art Gallery of NSW, the biennale’s Embassy of Spirits. The following two artists are being exhibited at the Museum of Contemporary Art, the Embassy of of Translation. 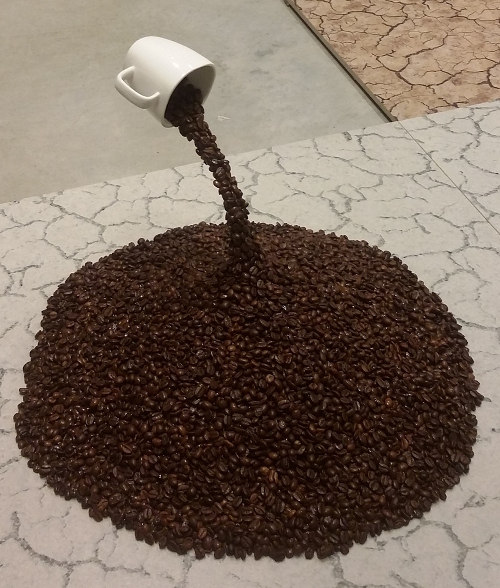 Two works by Nina Beier can be seen – Allegory of Charity and Tileables. Tileables are the ceramic squares seen on the floor in the photograph above and are based on textures developed for 3D modelling software. Allegory of Charity is a group of works showing coffee cups suspended in the air, a stream of coffee beans apparently pouring from them. Beier examines the translation between objects and image, taking stock images of mass produced products and recreating them in three dimensions. This could be viewed as the opposite of my recent work, where highly individual three dimensional works were created, then transformed into images using photography. Particularly in the black and white photographs and those of wrapped objects, the individual nature of the objects was in part repressed. Beier’s individual elements are repetitive with slight differences. Most obviously the coffee cups are different sizes and shapes. However all the cups appear to be commercially mass produced. The impact of the familiar object reminded me of observations in the workshop with Ruth Hadlow (25-Feb-2016). I took inspiration from drawings by John Bokor, whose work appears firmly located in the domestic and familiar. My own layered drawings included some of my collection of objects – not at all familiar or ordinary. At the time I asked where can ordinary lie. Beier has taken something very ordinary, impersonal, trite, and turned it into something unfamiliar, surreal. Dayanita Singh has an extensive photographic archive, built up over more than 30 years. Here Singh presents some of these in “mobile museums”, travelling to different locations, with a unique selection and display at each venue, the series of photographs open to a unique interpretation of meaning or narrative by each viewer. I don’t see the overall idea as new – Duchamp’s Boîte-en-valise comes to mind (I’ve seen the version at the National Gallery of Australia). At a very different level my weaving Cacophony traveled Australia as part of ATASDA‘s The Maharajah’s Garden suitcase exhibition (5-Feb-2010). 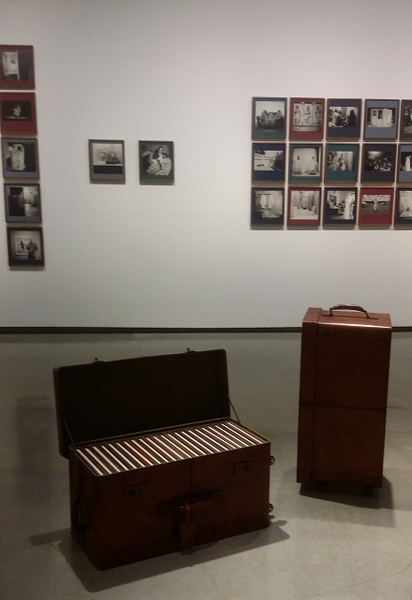 Singh’s two collections are beautifully presented, a series of moments that had me looking at details, wondering about other places and lives. Bringing it back to my current obsession, an accordion fold book of my collection photographs could be an effective way of making a final presentation, a sense of completion to my final work. It even has that lovely reference to the very first sample done for the course. I have a skype tutorial coming up in a few days, so can discuss the idea with Rebecca then. This was a fascinating exhibition given my own collection of vessels and the ongoing research on objects. In this post I will only discuss a few of the exhibitors. John Brooks’s installation included handwoven lengths and a projection. It was arranged to create a cave-life effect for the viewer. The video was reminiscent of B-grade science fiction movies, shambling bipeds moving through a rocky terrain. Of interest to me was the use of weaving – a technique I am keen to return to. The viewing screen was reflective tape including an a weaving, which also incorporated a fur-like effect similar to the bipeds’ costumes. The combination of textiles, video and performance was very effective. Nicole Monks also used performance and video in her work. The sculpture was made from wool and feathers, an amalgam of sheep and emu, introduced and native species respectively. It was animated through performance in the videos, set in a woolshed and in the Australian bush. Sound was important, grating machinery contrasting with bird song. The videos were strangely static, but the installation combined to give a dischordant, unsettling effect. The video and sculpture were less integrated, felt a little more clumsy than Brooks’s work, where any clumsiness seemed a deliberate choice. Hang up(s) / Pink is for …? Brett Alexander’s group of works may appear less relevant to my own work. Although three dimensional they were displayed mainly flat along a wall of the gallery with no additional multi-media element. I am particularly interested in how cohesive and yet how varied the collection was, given my own challenges with a wildly varied collection. 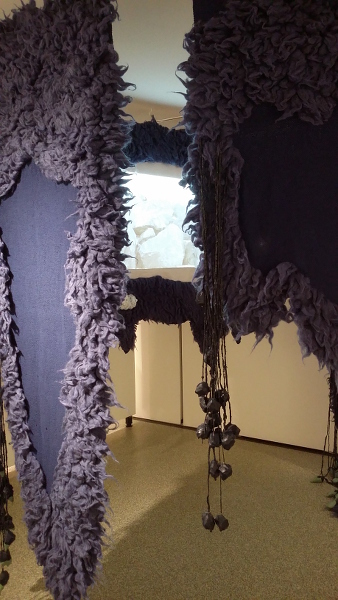 All the works shown used circular knitted yarn, hung to form narrow verticals with many variations in the detail. The palette was restricted, mainly pink, red, grey, black. 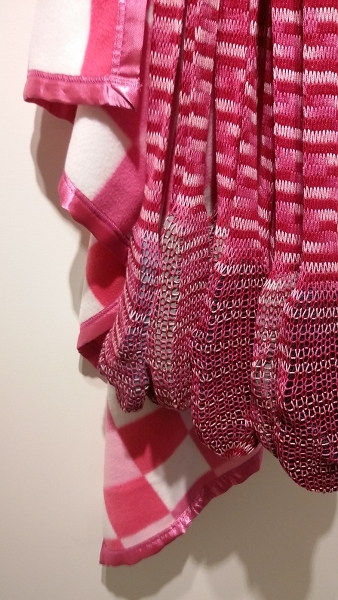 Alexander explores identity, challenges the feminisation of textiles. The works have a visceral quality and are often sexually charged. Overall lessons for me are to keep working on video and to keep thinking about what a collection of objects could be. Alexander’s group suggests that there can be a lot of variation between works while still maintaining unity. It’s not a simple repetition | individualistic dichotomy. However another revelation is that some of my collection, with suitable scaling and development, would not appear out of place in this exhibition. There’s the question of the focus on soft sculpture while most of my textile work was hardened in resin, but I think that would provide an interesting counterpoint, especially given the clear textile genesis. In a very haptic exhibition there was no touching – requiring firm self-discipline and losing part of the essence of “soft”. I could play with how much and where I used the resin. I also think some of my pieces show a response to gravity, an important element in Claes Oldenburg’s work (which was referenced via a quote from Celant in the exhibition. 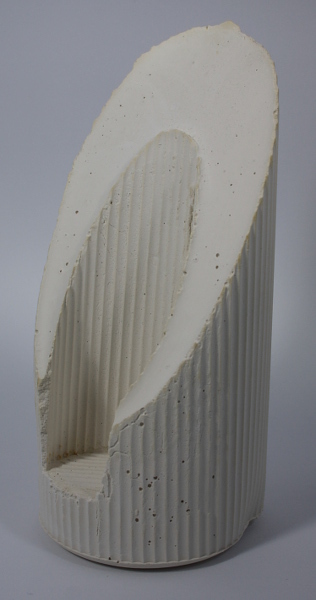 See my brief comment on Oldenburg’s work 7-Feb-2015). I’ve had pieces that were minor elements in ATASDA‘s non-juried exhibitions. I’ve never before thought that my work could bring an interesting additional element to an exhibition like this. Make the course my own. Take risks and challenge myself. For me the course has been an outstanding success on all of these. I have taken sidetracks, for example into 3D printing and the 3D pen. I have interpreted various requirements to suit my own interests, such as exploring presentation as prototype/maquette-making in stage 6 of the final assignment. My attitude to risk and failure has changed dramatically, actively seeking to push boundaries and seeing failures, whether opportunities or not worth following up, as a normal part of the process. My confidence has soared. It’s been a very busy, enjoyable, engaging, revealing year. The working process provided in the course seems a very good fit to my personal preferences. The cycle of Research – Sample making – Recording – Sorting, always experimenting and exploring, works well. Sometimes in practice rather than a well defined sequence the different stages seem to overlap, but I think that actually there are micro-cycles of making-recording-sorting happening in virtually every work session, while research is ongoing. A workshop with Ruth Hadlow (25-Feb-2016) gave me a way of developing my own briefs, and the combination of process and self-generated briefs offers a way of working in the future that really excites me. To create a new sample, p3-46 (23-Sep-2015). 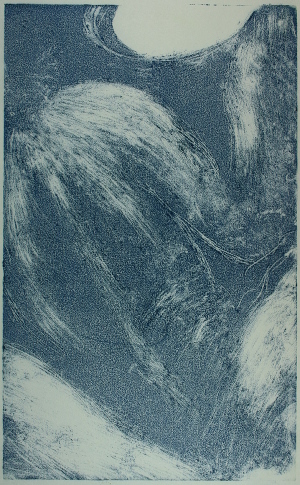 Was used with mono-printing, p4-32 (27-Oct-2015), to create additional texture and pattern in the print. Sketchbook work has been integral through most areas of the course from initial research (for example 20-Mar-2015), recording samples (such as sample p2-2, 6-Jun-2015), an exploration of mark-making, media and scale (28-Sep-2015), developing ideas for sample development (included on page 047 15-Feb-2016). I struggled with maintaining a sketchbook during the printing of assignment 4 (one exception was developing the design for print p4-37, 3-Nov-2015), but refocused and came back strongly during assignment 5 (for example page 015, posted 10-Jan-2016). I extended my skills in additional workshops, for example mixed media with Graham Marchant (24-Jan-2016) and a mind-opening workshop with Ruth Hadlow (25-Feb-2016, the results ongoing as seen page 054, 27-Feb-2016). Through these and more I have experimented with a wide range of media and substrates. Research informs and underpins a lot of the work done in this course, together with large sections which have been more materials led experimentation. Research on Degas (22-Oct-2015), including an attempt to copy directly from his work (print p4-36, posted 27-Oct-2015) helped me work through initial problems and discouragment in the printing assignment. Encouragment from my tutor, Rebecca Fairley, to really pick apart my research material to learn from it, bore fruit in my work on Gillian Lowndes (26-Feb-2016). 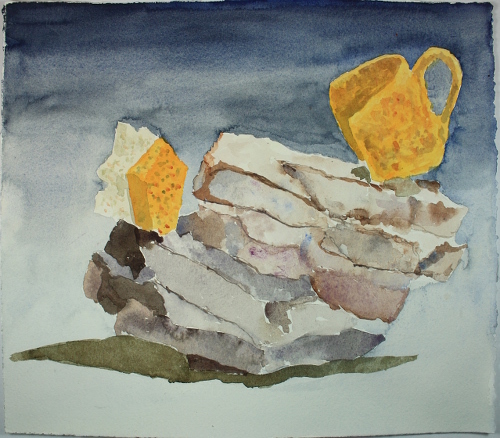 The watercolour sketch shown here (posted 31-Jan-2016) was one of many based on Lowndes work, and shows a piece that was pivotal in my presentation efforts in the final assignment. As well as focused research based on specific coursework I enjoy going to galleries, exhibitions, museums, lectures and so on, and as well as general enrichment these often provided insights relevant to my course. 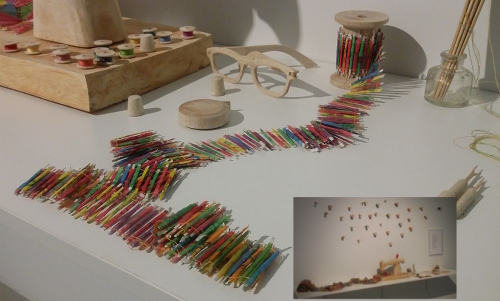 For example Lorna Murray’s work seen at the 2nd Tamworth Textile Triennial (22-May-2015) became relevant research for joining straight edges with a gap (14-Jun-2016), and in this Reflection I realise would also have been of interest to my development of a collection. Interaction with other OCA students has been of growing importance to my experience of distance study. I read many blogs, maintaining a blog roll at http://fibresofbeing.blogspot.com.au/ and there are ongoing relationships via comments and in general discussion on the OCA textiles forum. More directly various students have assisted me during this course, for instance allowing me to include their work in research (7-Feb-2016), responding to a request on the Forum for research suggestions, and after another request giving thoughtful feedback on my video attempts (including 5-Feb-2016). My time management has been strong throughout this course and I believe that is both a cause and an effect of relatively low stress levels and high enjoyment factor over the year. The course promotes experimentation and sampling, which really has no defined end. From the start I have had an overall timetable, which has become more detailed when working on a particular section, down to weekly and sometimes daily goals. I stop when I run out of time (making sure there’s sufficient time left to complete wrap-up, blog posts etc). I’ll be submitting this assignment two weeks after the original date set, a follow-on from an extra two weeks taken on printing and year end break. There will always be loose ends, more I wish I’d done, more ideas and enticing paths to explore. I could always do better – but at the cost of not doing something else. I think this is worth recording, because it’s something I want to hold on to. Throughout the course I have tried to give care and attention to my making. I have a range of textile skills built up over the years and working in mixed media gave me the opportunity to adapt those and develop more. Not all experiments have been successful. An interim stage of sample p5-12 (23-Feb-2016) had a beautiful simplicity, an intriguing shape, and I was very tempted to stop at that point. However I had further development planned and felt impelled to take the risk. The final result is problematic. It was useful to give height in group presentation, it provides a link between plaster, resin and organza samples. However there are technical flaws and clumsy elements. It is much less satisfying as an object in itself. Composition and attractive presentation of work, especially using photography in this blog, has been a goal from the beginning of the course (shown is joining sample p2-3, 6-Jun-2015). This led to the decision to make photographic and video presentation of my collection of samples the final work in Assignment 5, including photo sample p5-43 (12-Mar-2016). This blog has remained the mainstay of my presentation of work. Feedback on its organisation and ease of navigation has been positive, and it’s certainly a central part of my creative work, recording almost eight years of explorations. Recently I have added video to my presentation methods and I see that as a valuable addition to writing and photographs. During the course I have also created a series of pinterest boards, which allow easy collation of inspiration and potential research subjects and also a quick method for me to trace back to specific samples. Mixed media for textiles has provided a lot of opportunities to experiment with materials. My approach has been to work repeatedly with a relatively small set, finding new variations. For example drawing in plastic filament with a 3D pen allowed creation of new work, such as p2-6 (11-Jun-2015) and provided a means of sketching / recording / focusing on other samples, as seen in a sketch of sample p5-7 (6-Mar-2016). I believe this approach both stretches and deepens my skills and knowledge. As well as exploring a particular material it has been rewarding to use multiple materials creating related visual effects. For example there are many samples using corrugations. There were holes cut and shadow lines in cardboard in assignment 1 (including p1-129, 7-May-2015), corners in assignment 2 (p2-25, 27-Jun-2015), a similarity of form in a more ambitious join in p2-5 (7-Jun-2015), molded, distorted, stitched corrugations in composimold in assignment 3 (p3-33, 6-Sep-2015), at a stretch one could include the accordion pleated printing of p4-32 in assignment 4 (27-Oct-2015) but actual printing on corrugated cardboard (28-Sep-2015) is a better fit with the theme, and finally, in my opinion most beautifully, in plaster in assignment 5 (p5-11, 23-Feb-2016). I find the process of reflection in this blog an important part of seeing, focusing, on work done. During the final Part of the course I used a physical sketchbook in a more consistent way, but also periodically uploaded and reflected on each page. I have found it very useful to look at the work after a short break, with fresh eyes. As described above my research has included both in-depth analyses and more casual influences. 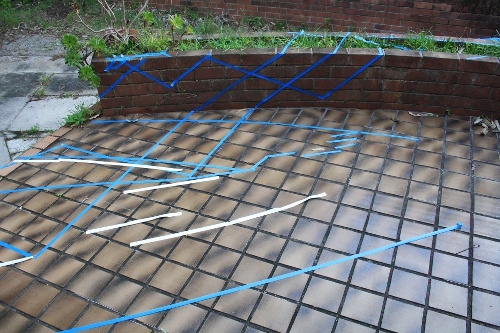 One interesting exercise which was based on a combination of multiple fragments of research was wrapping an outdoor space, marking the changing boundary of light and shadow (sample p2-79, 31-Jul-2015). The link to the wrapping topic was perhaps tenuous, but it led to some intriguing ideas and outcome. With hindsight one can detect my ongoing interest in exploring space. Another ongoing thread is based in the work of Eva Hesse. 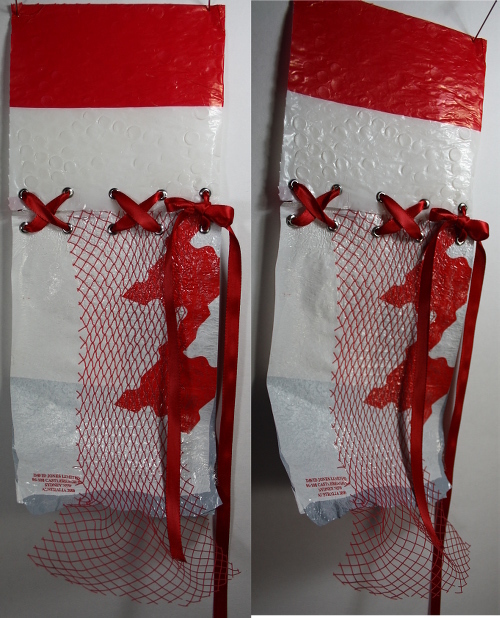 I did initial research on this artist in the context of joining and wrapping (7-Jun-2015) and a response to her work can be seen in sample p2-4 (a separate post 7-Jun-2015). Hesse’s work was again relevant to my research in Part 5, looking at collections of vessels. As detailed in my reflection of that Part (27-Mar-2016) that research is ongoing. “Ongoing”. Having reflected on the past year’s work it feels very appropriate to finish with that word, because that is what I want to do. Go on. It’s just not clear to me on what path. As described previously there are loose ends (20-Mar-2016), and as detailed above I feel this course has equipped me with a process to continue explorations. I know I am interested in objects and space. There’s another strand around art movements of the 20th century, both mainstream art history and the fibre arts movement. On the other hand I am not at all interested in working in fashion or furnishings, nor in colour forecasts which seem relevant primarily in those fields. I have learnt and grown so much studying with OCA, and in particular in this course. I enjoy structured learning, partly because I often discover more than I expect in things I thought I wasn’t interested in. But there is only so much time. I’m not sure which way ongoing lies.